Flood Bros. Disposal presents The Skinny & Houli Show and this week we are honored to have the one and only Geno Cooney sitting in for Skinny, who is otherwise engaged. 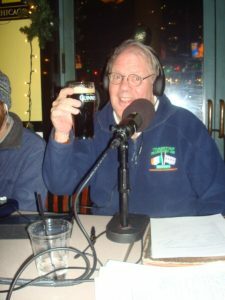 Geno is current President of the Irish American Heritage Center, co-host with Houli on The Craic Radio program, and also leading our 2018 Craic Tour of Ireland. Geno gives us the lineup for the upcoming Irish Fest July 6-7-8 at the Heritage Center and we welcome Jim Sullivan and Jimmy Moore to the show, both of whom will be performing in the Folk Tent at Irish Fest. The lads perform some tunes from Jim’s CD “Catching The Heart Off Guard”, which he dedicated to his late brother. Then the lovely Julia Jameson from Special Olympics drops by to promote the upcoming 50th Anniversary celebration of the Chicago founding of Special Olympics at Soldier Field and Northerly Island on July 21st. We hear Jim Sullivan sing “No Frontiers”, “McAlpine’s Fusiliers”, and “Isle of Innisfree”. Great show for the tunes and the banter, don’t miss this show as we capture another gorgeous night on the river!